As I set out on my hike in the warm morning air, I realized that today would be a likely day to see a snake. Today was predicted to be a hot day following on a warming trend over the last several days. 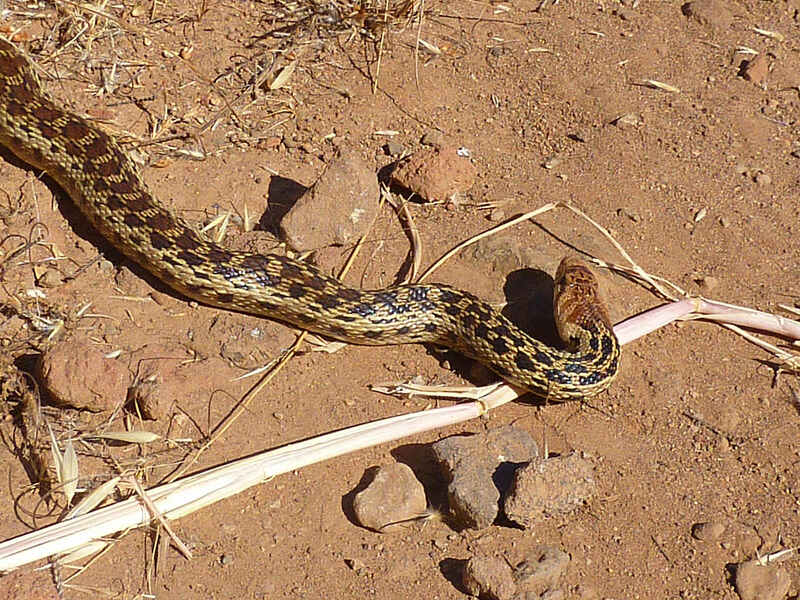 It proved to be prophetic, as a group of us who converged on the Overlook upper meadow at about the same time were treated to spotting a gopher snake (see picture from a previous sighting). Gopher snakes have similar markings to a rattlesnake, so they are often mis-identified. The simplest way to tell is to look for rattles — if the snake has rattles, it’s a rattlesnake, if it doesn’t, it’s a gopher snake. The gopher’s head is also not as spade-shaped as a rattlesnake. Although many people are afraid of snakes — and especially the poisonous rattlesnake — snakes are a necessary part of our ecosystem. Without predators, ecosystems can fall tragically out of balance and perhaps damage an ecosystem irreparably. They also tend to avoid humans if they can, and it’s usually only when they are surprised or cornered do they strike. In a conversation later the same day, a man recounted the story of a relative running the trail just last week who was nearly bitten by a rattler as she ran past. It missed because she was in rapid motion, but it was likely because she was in rapid motion and going past the snake in close proximity that it chose to strike. This is why it is very important to watch the ground ahead of you, especially when running. When hiking the snake usually has time to sound a warning before you get too close. I have had this happen on the trail. So now that snakes are out of hibernation and on the Montini and Overlook properties, stay alert! If you can avoid riling up a snake it can be a pleasant outdoor experience to see a predator up close and watch it slide away into the grass. Let’s hope this describes all of your future snake encounters. Wild flowers are not the only things now gracing the hills above Sonoma that a network of trails traverse. Lizards of a number of different varieties are out in profusion as well. Many times on the trail I’ve thought I would surely step on one, but they zip down the trail or off into the underbrush with a speed that is astonishing given how low to the ground they are. The wide variety of lizards always has me checking to see if I’ve seen that type before, and recently I’ve been rewarded with seeing some quite beautiful types. 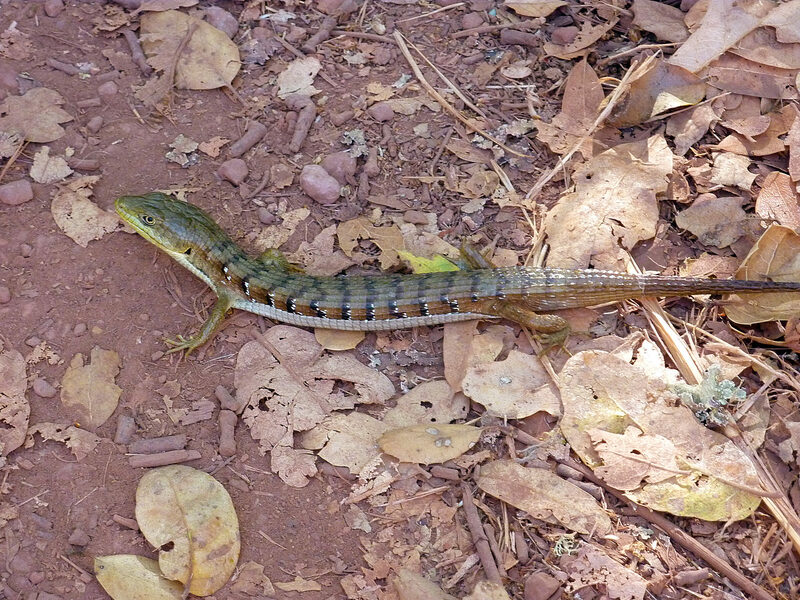 The California Alligator Lizard is certainly one of the largest you will see on the trail, and also one of the most colorful with it’s stripes of alternating colors. But there are many other varieties as well. A very useful web site for identifying lizards is the CaliforniaHerps.com, which provides a visual index to try to spot the one you saw on the trail. 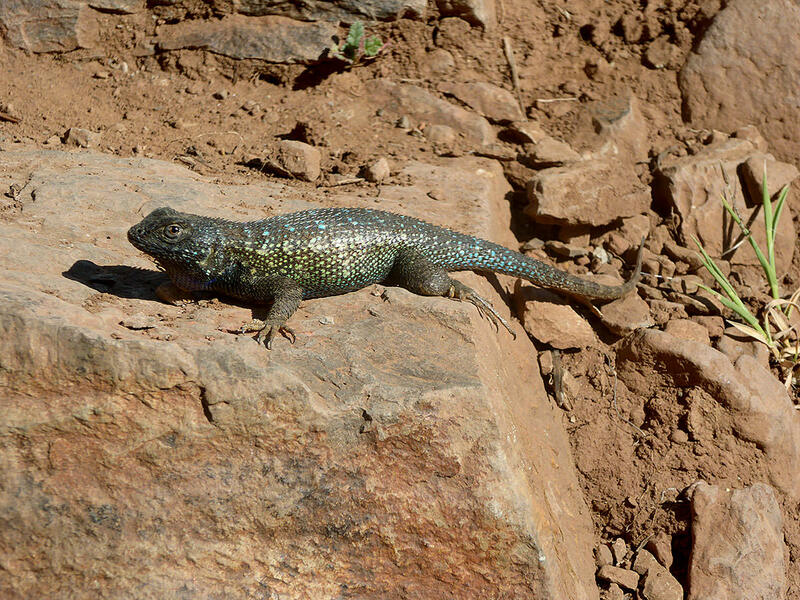 Since lizards are cold-blooded and must regulate their body temperature by careful but frequent sun exposure, you can sometimes see them sunning themselves on a rock (pictured at left) or on the trail. If you have a camera with a long enough optical zoom (say 20-30x), you can sometimes get in close with the camera without scaring the little guy off. This is important, as they are easily scared by us giant humans thundering down the trail. Recently I saw a multi-colored lizard smack in the middle of the trail just below the Overlook Trail meadow (pictured at right). I’m not very good at identifying lizards, but I think this fellow is one of the types of Fence Lizard. 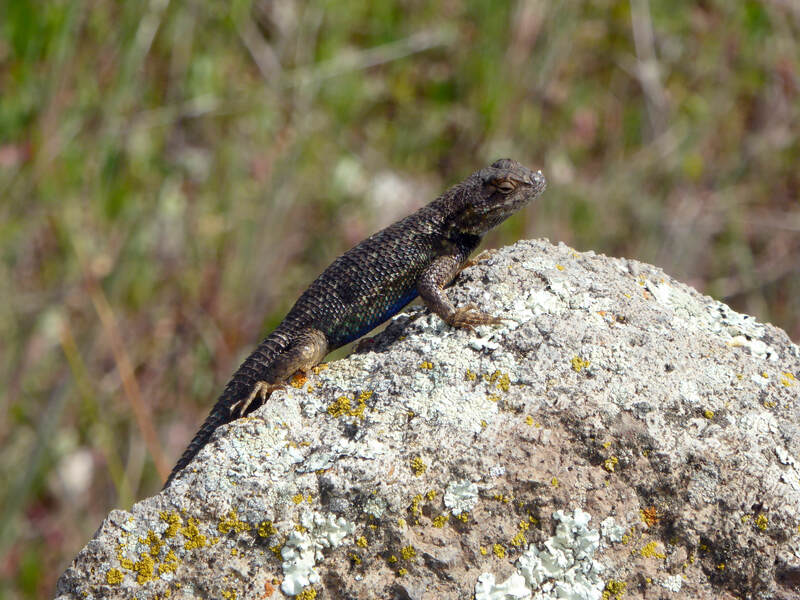 But whatever the types, there are clearly at least half-a-dozen or more different species of lizard that can be found on the Sonoma Overlook Trail and Montini Open Space Preserve, and that’s just fine by me. Most days you’ll find me hiking the trail with an eye scoping the ground, partly to avoid rattlesnakes, but also to avoid stepping on these little guys. Sure, they’re quick, but I still worry. 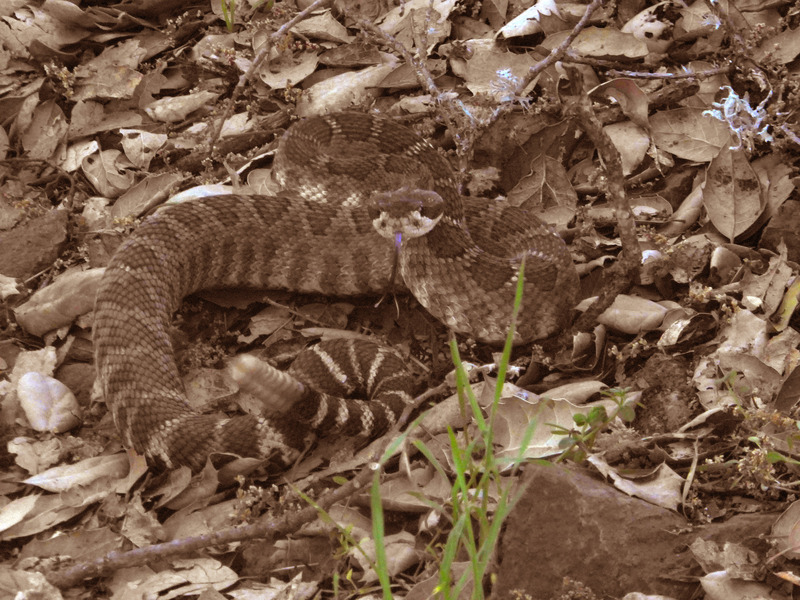 Wildflowers are not the only thing that are in season this March; rattlesnakes are also now coming out of hibernation. I ran into this fat and sassy specimen (pictured) last week on the Montini Preserve, right on the trail. I was heading East on the Holstein Hill Trail, and right after passing through the meadow above the water tanks, the trail enters into the trees again and quickly angles to the left. It was at that angle where this angry snake was sitting and ready to strike. Of course sightings like this are rare, particularly if you stick to the trail. I count myself lucky if I see one or two rattlers in an entire year, and I’m on the trails almost every day. Also, they don’t want to mess with you and more than you want to mess with them. So if you encounter a rattler, just back off and let the snake slither off the trail before proceeding. Or go back the way you came, which is what I did that day since I was “rattled” (sorry!) after my encounter with a snake so large and ready to strike. What really scared me was that I had just been thinking about breaking into a jog around that time, as that is a fairly flat stretch of trail, and if I might have been on the snake before it could warn me. So runners need to pay particular attention to the trail ahead! 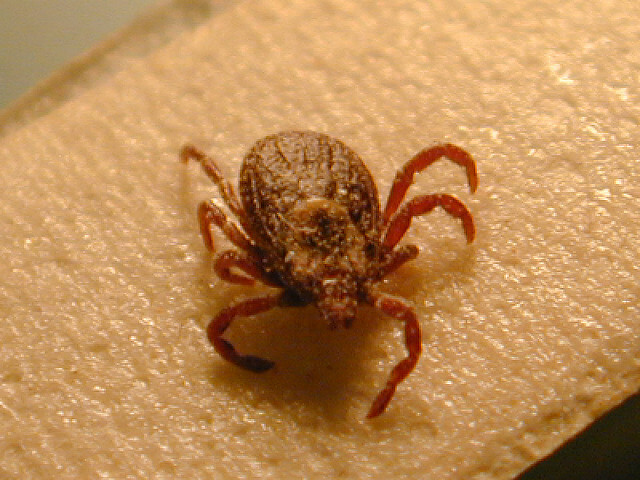 Should the worst have happened, I would have been better prepared if I had read the information that the California Department of Fish and Wildlife has on both avoiding snake bites and what to do if the worst happens. Big thanks to my fellow Steward Lisa Summers for the link.